BOTHELL, Wash. - Aug. 15, 2017 - PRLog -- Vicki Draper is a natural-born animal communicator, highly regarded modern-day healer and author who supports family animals with health, harmony, and ease, addressing wellness during every stage of your animal's life. With her skill set, she serves clients locally and remotely, nationally and internationally. Vicki is teaching a Worldwide Animal Communication Course called Animal Connection and Healing Group open to people locally, nationally and internationally. 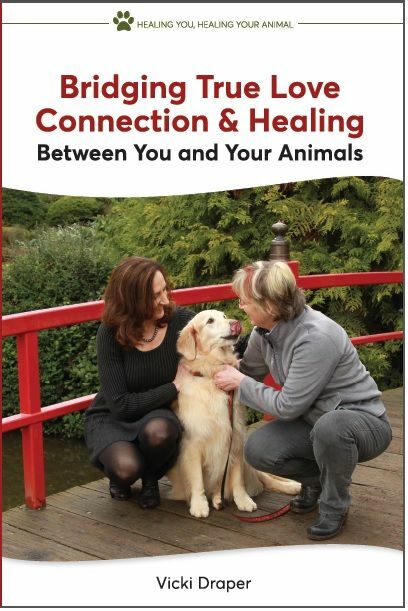 She is taking her book, "Bridging True Love Connection & Healing Between You and Your Animals" and bringing it to life in this class. People learn proven physical and energy healing techniques keeping not only their animal healthy, the person healthy too. Once class is dedicated to calming techniques for people and their animals. And people learn animal communication helping people and their animals bridge connection enhancing harmony in their lives. Participants receive lecture documents, class recording, supplemental videos and handouts enriching their learning experience. And have this information as a resource tool the rest of their lives. Every time the door opened, Kizzi ran outside into the street. She had been hit twice by cars. And Mary Kay was scared to death knowing that the next time might be the last. Mary Kay learned these healing techniques I teach in the Animal Connection and Healing Group that now has Kizzi happy to stay inside when the door opens and a great relief for Mary Kay.